Ellie Bean and the Puffins! | NJNA is Blogging! Ellie Bean and the Puffins! 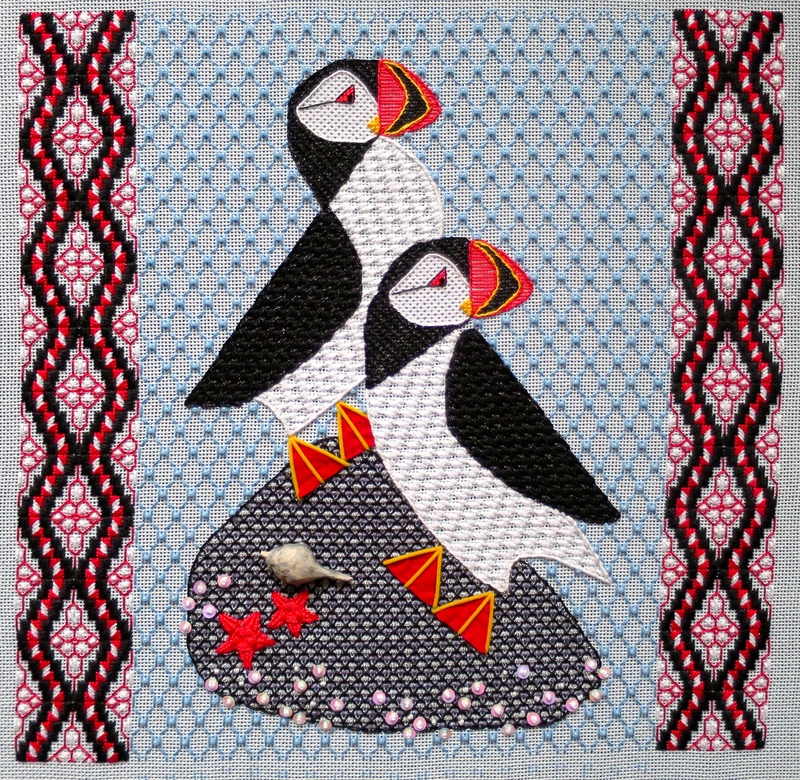 Today I finished the stitching for the pilot class of “Pair of Puffins Perched on a Prominence”. Puffins are perched! Gotta love that carved whelk! I had finished stitching the beaded background on Friday. However yesterday when I went to couch the puffin feet onto the rock, I discovered that part of the lower starfish was missing and a long length of thread was hanging from the canvas. As far as I can tell, Ellie Bean decided to eat the starfish while I was working on a jigsaw puzzle on Saturday. Or, she might have caught her claw in it when she was literally bouncing off the walls at the vegetarians (deer) in her new back yard. So, I had to do some starfish repair before I could couch down those puffin feet! Luckily I had plenty of thread and I don’t think the rework is too apparent. Besides, aren’t starfish known to grow new arms when one is broken off?? The Pair of Puffins Perched on a Prominence is now perched prominently on a high TV cabinet — far from the wandering teeth and claws of one determined puppy! Thanks to Ann Strite-Kurz for creating this whimsical design. I haven’t enjoyed stitching anything so much in a long time! It’s beautiful in person. Well done.